You’ve probably seen the memes or video clips on the internet about cats being jerks. They usually feature a cat pawing at an object on a table, desk or shelf until the object falls off. In our social media driven world, the most popular ones feature things being knocked down that either splatter or break. Does this mean cats are jerks? Most people who live with their cats agree with their cats are clever, not stupid or foolish. It’s true cats are literally small-minded. A human’s brain is about 50 times bigger than a cat’s brain. The size of their brain gives us one of the insights into whether they are cruel or rude. Those concepts are beyond their ability to grasp, but we are applying them to them because that’s how humans think. 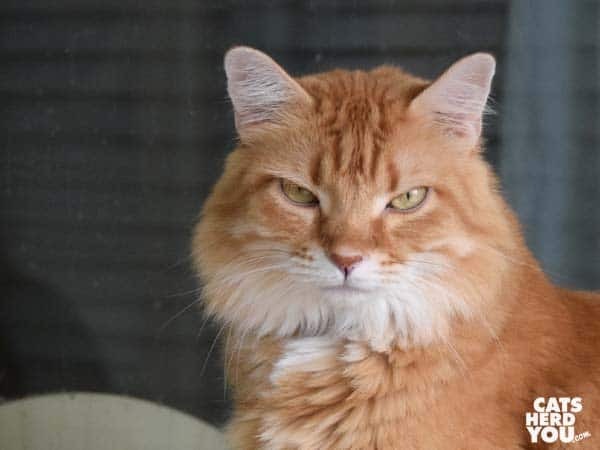 Your cat doesn’t know she’s being “a jerk.” She just knows simple cause and effect. Why does my cat knock things down? If your kitty doesn’t know she’s being “a jerk,” why is she doing it? Let’s look at it from a cat’s perspective. Kitty encounters a new pen on your desk. Even though the pen is small enough to bite, she is probably not going to grab it with her mouth first thing. Her instinct, honed by generations of cats who survived by their wits, tell her it is safer to touch it first to see how it reacts. So she reaches out with her paw and pats it. 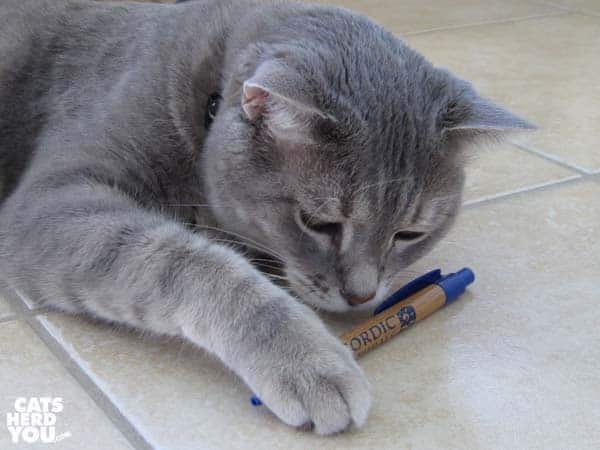 The pen moves, which is intriguing, so she pokes it harder with her paw. The pen moves more, maybe it even spins around. Hey, this is fun! She whacks the pen with her paw, and it flies off your desk onto the floor. Your cat used her instinct to explore her environment with her paws. That led to her hunting instinct kicking in when the object moved, so she engaged in play. She wasn’t being a jerk. She was being a cat! But now my cat knocks things down all night! What happens when kitty knocks that pen off your desk or remote control off your table? You probably pick it up. If you are in another room and hear something fall, you probably enter the room to make sure everything is OK.
What does this teach your cat? Knocking things down means you will stop what you are doing and pay attention to her. Score! Human attention. Kitty has just trained you. Big brains may not matter so much after all! One way kitty may use this newfound knowledge is at night, when humans are sleeping. From a cat’s perspective, sleeping humans are not interactive, and that’s not much fun. 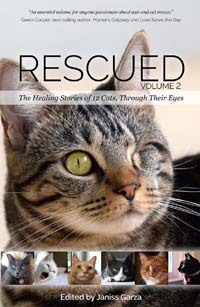 A restless cat may learn that knocking your glasses off your bedside table will make you much more interactive, and it might even get her a midnight snack when you try to distract her so you can go back to sleep. How do I make my cat less of a jerk? There are a few things you can do to help make your cat less likely to knock things down, especially at night when you are trying to sleep. If you don’t want to embrace a minimalist decorating style, try putting loose items away. Tucking pens or eyeglasses into a drawer can keep temptation away. If you don’t have drawers, consider decorative boxes or containers. If you are concerned that your cat will knock the container down, you can use a nonmarking adhesive intended for preventing objects from falling during earthquakes to secure the container in place. Make sure your cat is getting plenty of play time. 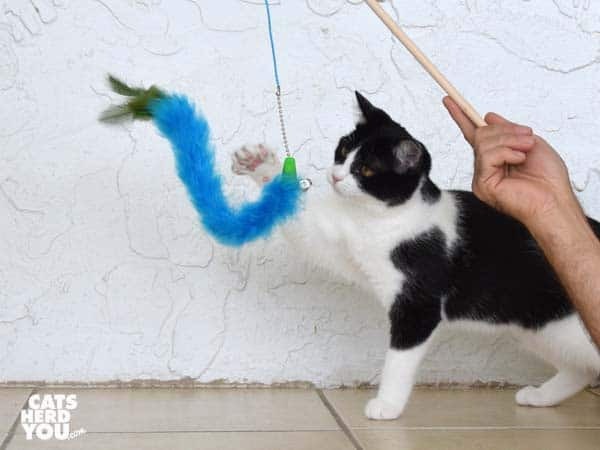 A rousing game of chase with the wand toy before bedtime will help keep your cat from being restless during the night and looking for objects that could become toys on your bedside table. Be sure your cat has toys available that keep her interested. This may mean rotating toys so they aren’t out all the time and seem “new” when they reappear. If your cat is especially active at night, look for toys that are quiet and don’t have bells or other loud features. Your reaction when your cat knocks things down is what turns a cat’s playful fun into attention-seeking behavior. It’s hard not to get up and feed Kitty when she knocks down a book, but if she discovers it doesn’t work, she will stop doing it to get your attention. We say people who call us jerks are jerks themselves. They don’t deserve our company! I’ve disliked that term for cats from the moment I was first on FB! Or if someone calls their cat an a**hole…what?!? Cats don’t do stuff out of spite; they do it to a: get some food, b: get some attention, or c: telling you that they are having a problem. Thank you for this post; we see eye to eye! My human goes the opposite way from minimalism – she has so much clutter, there’s no room for us cats to get on her desk or nightstand to knock things off! Rosie LOVES to knock things off the dresser and end tables in the middle of the night. She has me well-trained because I usually do get up and feed her, etc. jerkz ….than we can count………. “cats are literally small-minded. A human’s brain is about 50 times bigger than a cat’s brain.” Them are biting, er fighting words, human! My brain and intellect are twice the size of TW and Pop put together. I’ve never knocked things over. (TW says I’m too lazy. More biting words.) I seek attention other, smarted ways. People who say cats are jerks really make us hiss! Thanks for clearing the air. soooo good, with so many great points! !